Last weekend, tens of thousands of people marched in Washington, DC in the combined March for Racial Justice and March for Black Women. Native Americans joined black and brown people to lead the march. White Supremacy has been given aid and comfort by a so-called president and so-called administration, and so-called leaders of that ideology are comforted and feel that they are back as a centerpiece of American political life. From coast to coast, it is true that white supremacists are active and are being more visible than they have in decades. This weekend, Richard Spencer held another torch rally in Charlottesville. In Houston, fascists attacked a left-wing book fair, and the book fair organizers had to take action to protect attendees while police did not respond. Similar events happened in Portland, OR, San Diego, New York and Washington, DC. Not all events are successful. 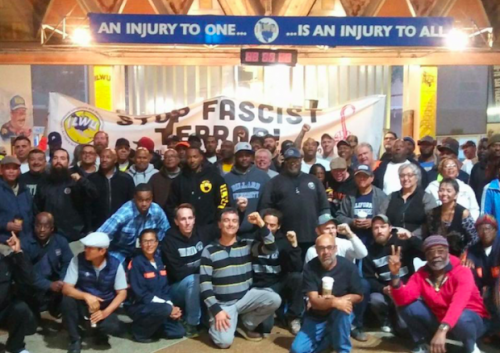 In San Francisco, International Longshore and Warehouse Union (ILWU Local 10) members and allies prevented a right-wing racist and violent group from holding a rally, thwarting the group at every attempt. And sometimes, white supremacists have to go to great lengths to hide their gatherings. David Lewis reports on how he infiltrated a secret convention in Seattle and saw how fascism is growing in Seattle the liberal city of the Northwest. White supremacy is not new, and it manifests itself in many ways, not only in overt white supremacists, but also culturally and systemically. With the rise of open white supremacy, there are discussions about and controversy over how to respond. Is there room for racism in civilized debates? This issue is particularly pertinent for us right now because a local Baltimore League of Women Voters chapter is holding a series of panel discussions on immigration to which they invited speakers from anti-immigrant white supremacist groups that are listed as hate groups by the Southern Poverty Law Center. The initial panel was protested by the local Green Party and others after The League refused to dis-invite the speaker and he was prevented from completing his presentation. He left the event. This sparked discussion in our community and raised many questions: Was this an infringement on his right to free speech? Is this starting a slippery slope to shutting down people’s right to free speech? Should he have been allowed to speak and then challenged during the question and answer period? What is hate speech and should it be prohibited? First, it should be clear that in a legal sense, individuals do not violate another individual’s right to free speech. The right to free speech is guaranteed by the First Amendment, which prevents the government, not individuals, from infringing on a person’s right to free speech. As long as the government protects the First Amendment, there is no slippery slope. Whether the government does protect free speech at present is a whole other conversation. Second, when it comes to what private organizations do, this is another matter entirely. Organizations and institutions do not have a requirement to include those who espouse hate. They are not required to give a platform to or legitimize white supremacist views. In fact, one could argue that it is anti-social to do so. Professor Matt Pratt Guterl, from Brown University, explains it well in “How American’s Faith in Civilized Debate is Fueling White Supremacy.” when he writes about a debate between WEB DuBois and racist Lothrop Stoddard in 1920′s describing it as based on “the bizarre premise that there are two sides equally deserving our attention.” No, the white supremacist view should not be given legitimacy. Hate speech is legally defined as “speech that is intended to insult, offend, or intimidate a person because of some trait (as race, religion, sexual orientation, national origin, or disability).” A Supreme Court ruling earlier this year found that hate speech is protected from government repression under the First Amendment. Yet, while many injustices are technically legal, that does not mean we should defend them. The International Covenant on the Elimination of All Forms of Racial Discrimination, adopted by the United Nations in 1965, clearly states that “all propaganda and all organizations” based on ideas or theories of racial or ethnic superiority should be illegal and that states should take “positive steps to eliminate them.” We would do better as a society to debate the best ways to eliminate white supremacy. I refer instead to a political, economic and cultural system in which whites overwhelmingly control power and material resources, conscious and unconscious ideas of white superiority and entitlement are widespread, and relations of white dominance and non-white subordination are daily reenacted across a broad array of institutions and social settings. White supremacy is the state of Mississippi taking control of Jackson’s schools away from the people of Jackson. It is policies designed to break up and destroy black communities in Baltimore (Cliff DuRand expands on this here). It is families in Flint, MI that lack clean water or in Detroit that have their water shut off for being a few hundred dollars behind in their bills while just down the road Nestlé pays $200 a year to bottle and sell public water. White supremacy is the attack on public sector unions when it is public jobs that have brought greater prosperity to black families. It is a system of college admissions that favors the wealthy when blacks have much less wealth than whites through centuries of policies that denied them. It is economic inequality in St. Louis that is maintained through racist and violent policing. 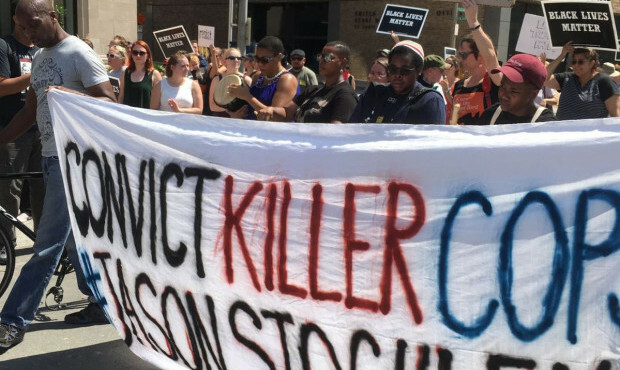 It is policies that perpetuate environmental injustice, which Basav Sen explains are just as devastating to communities as the overt white supremacy witnessed in places like Charlottesville. And it is not only the disgraceful lack of action to bring timely aid to our people in Puerto Rico after Hurricane Maria, similar to what happened after Hurricane Katrina, but also blatant discrimination by the US in the Marshall Islands. And it is evident in US foreign policy, which devalues the lives of black and brown people all over the world. Medea Benjamin describes the justifiable outrage over the murder victims in Las Vegas but the silence on the anniversary of the murder of even more Yemenis at a funeral last year. Another example is the brutal ethnic cleansing in West Papua under Indonesian occupation that was made possible more than fifty years ago by the New York Agreement, which left out participation by West Papuan people. They are still bravely fighting for their right to independence. 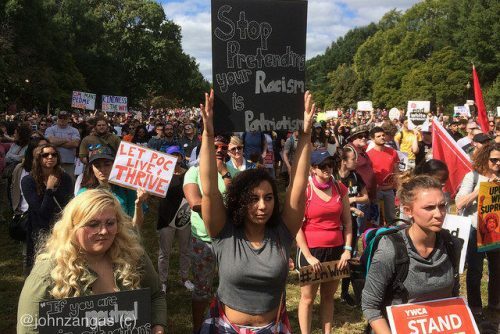 In our recent experience with the League of Women Voters in Maryland, we were accused of “falling for identity politics that are being used to divide and weaken people.” So, as we work to dismantle white supremacy, let’s recognize that there is already a wide racial divide in the United States. It is obvious every day through the examples given above and more. A powerful way to resist being divided is to unite around efforts to end institutions and policies of white supremacy. We cannot hope to unite as equals and as a strong society until that is accomplished. To do that, we need to move past allowing white supremacist ideas and theories to have a legitimate place in public debates. They have no place in our society except in textbooks so that future generations understand how destructive they were once upon a time. 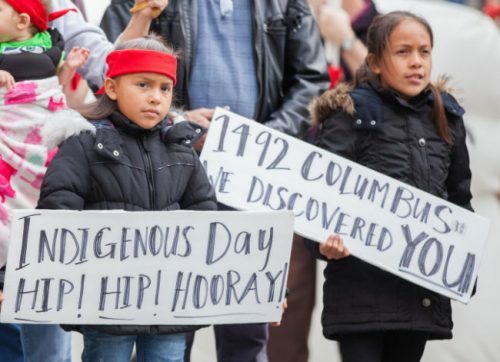 Bill Bigelow of Rethinking Schools has an article for “Columbus Day,” which many cities and states celebrate as Indigenous Peoples’ Day. Bigelow writes that in his review of children’s textbooks, he found “these books teach young readers that colonialism and racism are normal.” There is a long history of mis-education in the United States. Indeed, one candidate at the League of Women Voters’ panel informed us that we had open borders hundreds of years ago when “nobody was here,” completely ignoring the tens of millions of indigenous people in North America before settlers came. Peter Saudek describes his journey from being a child surrounded by lessons and symbols that warped his perception of Native Americans to his awakening to the realities of settler-colonialism. Let’s pull down the monuments, let’s make the holidays more inclusive, let’s rewrite the textbooks and children’s literature. But let’s also challenge the fundamental structures of ownership, power, and privilege that have given us such a skewed constellation of heroes and holidays. This article was posted on Monday, October 9th, 2017 at 12:51pm and is filed under Activism, Children/Youth, Racism, White Supremacy.